We are a "family friendly" falconry display team based in Hampshire, England. With facilities at Brambridge Park Garden Centre, Kiln Lane, Brambridge, near Winchester, Hampshire. For directions to Brambridge Park, please choose the lnk on the left. In addition to our facility at Brambridge Park, we provide falconry displays at shows, events and parties across the South of England and Home Counties. To find out how to book us for your event, or for information on our falconry courses and experiences, choose "Experience Falconry". 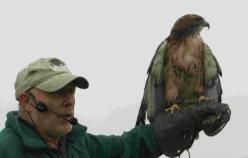 All of us at Falconhigh are deeply saddened to announce the death of Head Falconer Phil Oldham. Phil was the inspiration behind, creator and leader of Falconhigh. Through Falconhigh Phil presented his love of Birds of Prey in a natural way which introduced thousands, young and old, to the wild beauty of hawks, owls and falcons. His natural ability to explain and entertain made his shows a unique experience for everyone who took part or watched. Many a young person will always recall the day they felt the breath of the wings of a hawk as it flew inches from their head, or of an owl landing on their outstretched gloved hand (or hat). All thanks to Phil. Phil will be greatly missed by his family, friends and colleagues at Falconhigh and by the thousands whom he introduced to the world of beak, feather and claw. FLY HIGH PHIL, may the wind be always under your wings.